This brief describes the well-being of children and families living in the five Choice Neighborhoods. It explores how families in the target developments used services provided at the time of the baseline survey. Services include home-based infant and parenting services, early childhood education, and programs addressing educational and health challenges for parents and children. The brief lays the groundwork to understand how Choice grantees should target services toward families who need them most. At the time of the baseline survey, at least half of families had taken advantage of at least one of the services offered. The primary goal of US Department of Housing and Urban Development’s (HUD) Choice Neighborhoods Initiative is to improve housing. Choice investments can also improve neighborhoods and provide services that support families living in target developments before and after redevelopment. In each Choice Neighborhood, hundreds of public and assisted housing units are being built or rehabbed. At the same time, residents are being invited to participate in a wide range of programs intended to improve their self-sufficiency and quality of life. These services and case management efforts are designed to improve resident health, address child well-being by providing early childhood supports, and improve access to education, employment, and workforce development programs. Whether Choice will succeed in going beyond housing to improve health and well-being and reduce poverty depends on families’ ability to access high-quality supports that address the challenges they face and allow them to maximize their assets. This brief describes the well-being of children and families the first five Choice Neighborhoods implementation grantees serve. It explores how families in the target developments used services provided by Choice at the time of the Choice Neighborhoods baseline survey.1 When the survey was conducted from July 2013 to May 2014, programming was just launching and residents from most neighborhoods had not yet been relocated. Services aimed at families with children included home-based infant and parenting services and full-day early childhood education, as well as programs addressing educational and health challenges for both parents and children. In four out of five Choice Neighborhoods, families with children under 18 make up one-third or more of the neighborhood population. The Quincy Corridor neighborhood in Boston has the highest percentage of families with children at 59 percent, and the Iberville/Tremé neighborhood in New Orleans has the lowest share at 23 percent. Across all five Choice Neighborhoods, the target development has higher percentages of families with children than the surrounding neighborhood. Shares are highest in the Woodledge/Morrant Bay target development in Boston at 73 percent and lowest in the Iberville target development in New Orleans at 36 percent. The prevalence of families with children in each target development suggests that Choice grantees must focus services on the needs of both children and their parents and guardians. Although the five Choice Neighborhoods vary significantly, children and families in each face many of the same challenges. According to the Choice Neighborhoods baseline survey, poverty rates ranged from 26 to 42 percent and were at least twice as high as the national poverty rate of 15 percent in four out of five neighborhoods (see Bishaw 2012). Families living in the target developments reported lower incomes than those in surrounding neighborhoods. Poverty during childhood has been linked to lower school attendance, lower reading and math test scores, higher dropout rates, and behavioral issues (Dahl and Lochner 2005; Leventhal, Dupéré, and Brooks-Gunn 2009; Moore et al. 2002). In four out of the five surrounding Choice Neighborhoods, between about 70 and 80 percent of families with children were living in single-parent households, more than twice the 2013 national figure of 35 percent.2 When comparing a target development with its surrounding neighborhood, the neighborhood had a lower percentage of single parents (figure 1). Children in single-parent families fare worse on measures of child well-being (including educational attainment and behavioral issues) than children in two-parent families. However, research is mixed on whether growing up in a single-parent family has a direct effect on child well-being; other factors, such as lower income and parental mental health, could be at play (Brown 2004; Golden, Loprest, and Zedlewski 2006). Choice provides home-based infant and parenting services and full-day early childhood education, for single and dual parents alike, in Yesler Terrace (Seattle), Iberville (New Orleans), and Alice Griffith (San Francisco). 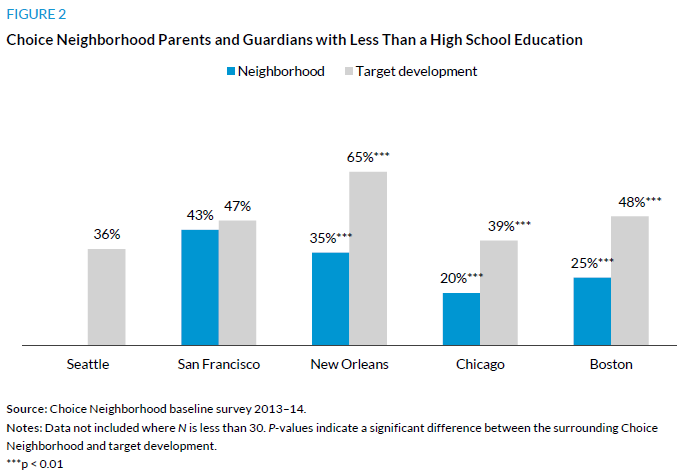 Compared with the national average, parents and guardians in Choice Neighborhoods had lower levels of education (Child Trends 2014).3 Within the Choice Neighborhoods, families living in target developments reported lower levels of education than those in the surrounding neighborhoods. Between 20 and 43 percent of parents and guardians living in the five Choice Neighborhoods did not have a high school diploma or GED (figure 2). Most Choice parents and guardians were satisfied with how their children were doing in school. To ensure that the Choice baseline survey was manageable for parents, parents with more than child were only asked about one of their children.4 In each of the five Choice Neighborhoods, nearly 60 percent reported that their child’s schoolwork was excellent or above average. Recognizing the need to help parents and guardians as well as children, Choice grantees in Iberville, Alice Griffith, Grove Parc (Chicago), and Yesler Terrace have implemented programs that use a two-generation model to improve educational outcomes for both adults and children. The percentage of parents and guardians in each Choice Neighborhood who reported they were in excellent, very good, or good health was lower than the national average.5 According to the 2011/2012 National Survey of Children’s Health, 80 to 90 percent of parents reported that they were in excellent, very good, or good health, compared with only 70 to 80 percent of parents in Choice Neighborhoods. Parents in the target developments rated their health worse than those in surrounding neighborhoods in three out of five Choice Neighborhoods. Rates of health insurance coverage do not explain the lower health ratings in Choice Neighborhoods. Compared with the national average (86.6 percent in 2013) insurance rates were higher in all Choice Neighborhoods and target developments (Smith and Medalia 2014, 2). Additionally, between 86 and 90 percent of families with children reported that they had at least one health provider to call upon when sick. Although a majority of parents reported that they were physically healthy, many dealt with mental health issues. Using the five-item Mental Health Inventory Scale, 23 to 46 percent of Choice Neighborhood parents had a score low enough to indicate a possible mental health issue. Rates are highest in Iberville/Tremé and lowest in Woodlawn in Chicago. Target development residents are more likely to have low scores than surrounding neighborhood residents, except in Quincy Corridor. To address some of these health issues, Choice grantees partner with various community and nonprofit health care providers. At Yesler Terrace a health clinic has been set up at the local elementary school, while in Woodledge/Morrant Bay a healthy food initiative has been developed. For more information on the health issues faced by families in the Choice Neighborhoods, see the brief titled “Health Conditions in Five Choice Neighborhoods”(Jordan 2015). When asked if their child had changed schools in the past two years for a reason other than graduation, about one-quarter of parents and guardians in each Choice Neighborhood said yes. This baseline statistic is comparable to the school mobility rates found in other low-income neighborhoods (Theodos, Coulton, and Budde 2014). Since relocation is part of the Choice program, children are likely to change schools at a higher rate than that observed at baseline (box 1). Changing schools can be disruptive and may cause children to fall behind peers who did not switch schools (Hanushek, Kain, and Rivkin 2004; Mehana and Reynolds 2004). To help children who have switched schools, it should be a priority for Choice grantees to work with local schools to provide adequate supports for the children affected. Encouragingly, families with children are taking advantage of the many services offered by Choice grantees. Across the five target developments, 50 to 79 percent of families used at least one service in the past 12 months.7 The service-use rate for adult-focused services, which includes such services as job training, ESL classes, and help with health concerns, was highest at Yesler Terrace and lowest at Iberville. Rates of usage of services aimed at children were highest at Alice Griffith and lowest at Iberville (figure 4). Child-focused services include after-school, mentoring, or tutoring programs more often than programs offering child care assistance. Between 43 (Grove Parc) and 70 percent (Alice Griffith) of parents in the five target developments reported that their children attended an after-school program. Parents and guardians took advantage of services for themselves at higher rates than for their children. Between 43 and 73 percent reported receiving services for themselves, while between 36 and 60 percent reported receiving services for their children. Understanding the challenges faced by families with children in Choice Neighborhoods is important for making sure their needs are met before, during, and after the relocation process. At the time of the Choice Neighborhood baseline survey, Choice grantees provided families with supportive services and case management to address a variety of issues. While it is too soon to see how these services will be used and how relocation will affect families, at least half of families had taken advantage of at least one of the services. Families living in Choice Neighborhoods, especially those in target developments, already face a myriad of challenges and it is likely that relocation will compound these issues for many. Although these challenges are well documented and services are being made available, more data are needed to understand if enough services are available and whether families most in need of services are finding them. To help children cope with relocation, Choice grantees must engage with local schools and develop programs that address the challenges children may face after changing schools. Parents and guardians and their children could benefit from a focused case management program that helps them access programs across a variety of service areas. An intensive case management program coordinating job training, workforce development, and programs addressing health and mental health issues is needed both before and after relocation. Where necessary, these efforts should focus on the whole family’s needs and include two-generation programs. While Choice grantees have already implemented some of these programs, more coordinated efforts are needed to improve residents’ health and well-being. The Choice baseline report noted that grantees’ limited capacity and resources—HUD funding for services makes up only a small portion of the total funds—were the biggest challenges to developing intensive case management programs (Pendall et. el 2015b). To address this issue, grantees will need to partner with local service providers and leverage those relationships to secure more funding from other federal, state, and local agencies. When developing a service model, grantees should look to other successful programs, such as Housing Opportunity and Services Together (HOST), that provide families in public and mixed-income housing with targeted two-generation services to overcome the health, education, and employment barriers that prevent them from being self-sufficient (Popkin et al. 2012). As of 2015, HOST operates in four sites and its model could be used as a guide as relocation progresses and grantees expand their efforts to help residents. HUD’s Choice Neighborhoods Initiative (Choice) aims to transform distressed, high-poverty neighborhoods into revitalized mixed-income neighborhoods by rebuilding distressed public and assisted housing into energy-efficient, mixed-income housing that is physically and financially viable. In addition to rebuilding, Choice provides services to support residents in the target developments and the surrounding neighborhoods through programs focused on improving health, safety, employment, mobility, and education outcomes. To better understand the effects Choice has had on neighborhoods and their residents, The Urban Institute and MDRC studied the baseline conditions and activities of grantees at the first five Choice implementation sites: Quincy Corridor in Boston, Woodlawn in Chicago, Iberville/Tremé in New Orleans, Eastern Bayview in San Francisco, and Yesler in Seattle. The team collected baseline data in these five neighborhoods and their target housing developments through a variety of means including a resident survey and interviews with key stakeholders. The research team produced two reports to document its findings. The first, an interim report (Pendall et al. 2015a), was produced in December 2013 to describe the five sites and their Choice plans. The second, a comprehensive baseline report, covered early implementation and summary findings from the baseline survey (Pendall et al. 2015b). This set of fact sheets, created in partnership with the Annie E. Casey Foundation, builds off that survey data and explore issues relating to child and family well-being across the five implementation sites. Between 2013 and 2014 the Urban Institute fielded the Choice Neighborhoods baseline survey at each of the first five Choice Neighborhoods implementation grantees. The survey instrument captures a range of information and outcomes related to resident health and well-being, housing unit quality and needs, neighborhood safety, services, and amenities, child well-being, employment, education, and public assistance. The survey used a stratified sampling strategy to randomly select samples of two independent groups at each Choice Neighborhood: residents who lived in the target development at the time of the first round Choice Neighborhoods Initiative application in December 2010 and residents living within the Choice Neighborhood footprint. For both samples, the head of household was the main respondent. Response rates for the target development sample ranged between 80 to 87 percent, and response rates for the Neighborhood sample ranged from 35 to 50 percent. The survey table (table A.1) describes the basic characteristics of respondents at each site, for those in the target housing developments and neighborhoods. For background on Choice Neighborhoods project and clarification of the neighborhoods and target development in each city, please see Appendix A. KIDS COUNT, “Children in Single-Parent Families,” last modified October 2015, accessed November 23, 2015. Child and Adolescent Health Measurement Initiative, “Data Resource Center for Child and Adolescent Health,” results of 2011/12 National Survey of Children’s Health, 2012. The Mental Health Inventory Scale was developed as part of the National Health Insurance Study. The five-item version used in the Choice Neighborhood baseline survey asks respondents how often during the past month they have (1) been very nervous, (2) felt calm and peaceful, (3) felt downhearted and blue, (4) been happy, and (5) felt so down in the dumps that nothing could cheer them up. For each respondent, a mean response was calculated and then transformed into a 100-point scale. A score less than 76 may indicate a mental health problem. National Health Interview Survey, “Lifetime Asthma Prevalence Percents by Age,” 2013, last modified February 13, 2015, accessed November 23, 2015. Services provided at Choice sites included classes or job training, ESL classes, sessions regarding lease compliance, help with health concerns, one-on-one or group counseling sessions, help accessing or paying for child care, and, for children, after-school, mentoring, or tutoring programs. Bishaw, Alemayehu. 2012. Poverty: 2010 and 2012, American Community Survey Briefs. Washington, DC: US Census Bureau. Brown, Susan L. 2004. “Family Structure and Child Well-Being: The Significance of Parental Cohabitation.” Journal of Marriage and the Family 66 (2): 351–67. Child Trends. 2014. “Appendix 1: Percentage Distribution of Children Ages 6–18, by Residential Parents’ Educational Attainment and Child’s Race and Hispanic Origin, Selected Years, 1974–2013.” In Child Trends Data Bank. Dahl, Gordon, and Lance Lochner. 2005. “The Impact of Family Income on Child Achievement.” Discussion Paper 1305-05. Madison, WI: Institute for Research on Poverty. Golden, Olivia, Pamela Loprest, and Sheila Zedlewski. 2006. “Parents and Children Facing a World of Risk: Next Steps toward a Working Families Agenda.” Low-Income Working Families Paper 5. Washington, DC: Urban Institute. Hanushek, Eric A., John F. Kain, and Steven G. Rivkin. 2004. “Disruption versus Tiebout Improvement: The Costs and Benefits of Switching School.” Journal of Public Economics 88 (9–10): 1721–46. Jordan, Reed. 2015. “Health Conditions in Five Choice Neighborhoods.” Washington, DC: Urban Institute. Leventhal, Tama, Véronique Dupéré, and Jeanne Brooks-Gunn. 2009. “Neighborhood Influences on Adolescent Development.” In Handbook of Adolescent Psychology, 3rd ed., edited by Richard M. Lerner and Laurence Steinberg, 411–43. New York: John Wiley & Sons. Mehana, Majida, and Arthur J. Reynolds. 2004. “School Mobility and Achievement: A Meta-Analysis.” Children and Youth Services Review 26 (1): 93–119. Moore, Kristin Anderson, Zakia Redd, Mary Burkhauser, Kassim Mbwana, and Ashleigh Collins. 2002. “Children in Poverty: Trends, Consequences, and Policy Options.” Research Brief 2009-11. Bethesda, MD: Child Trends. Pendall, Rolf, Martin D. Abravanel, Audra Brecher, Alex Curley, Elizabeth Davies, Megan Gallagher, Monica Getahun, et al. 2015a. “Developing Choice Neighborhoods: An Early Look at Implementation in Five Sites.” Washington, DC: Urban Institute. Pendall, Rolf, Leah Hendey, David Greenberg, Kathryn L.S. Pettit, Diane K. Levy, Amy Khare, Megan Gallagher, Mark Joseph, Alex Curley, et al. 2015b. “Choice Neighborhoods: Baseline Conditions and Early Progress.” Washington, DC: US Department of Housing and Urban Development. Popkin, Susan, Molly M. Scott, Joe Parilla, Elsa Falkenburger, Marla McDaniel, and Shinwon Kyung. 2012. “Planning the Housing Opportunity and Services Together Demonstration: Challenges and Lessons Learned.” Housing Opportunity and Services Together Brief 1. Washington DC: Urban Institute. Smith, Jessica C., and Carla Medalia. 2014. “Health Insurance Coverage in the Unites States: 2013, Current Population Report.” Washington, DC: US Census Bureau. Theodos, Brett, Claudia Coulton, and Amos Budde. 2014. “Getting to Better Performing Schools: The Role of Residential Mobility in School Attainment in Low-Income Neighborhoods.” Cityscape 16 (1): 61–84. Alexandra Derian is a research associate in the Metropolitan Housing and Communities Policy Center at the Urban Institute, where her research focuses primarily on housing and land use. She has managed and worked on projects evaluating the performance of government and nonprofit housing initiatives as well as analyzed the ways land use and economic development policy can be used to encourage development of equitable, mixed-income communities. This brief was funded by the Annie E. Casey Foundation. Funding for the Choice Neighborhoods baseline survey was provided by the US Department of Housing and Urban Development. We are grateful to them and to all our funders, who make it possible for Urban to advance its mission. The author thanks Paul Joice at the US Department of Housing and Urban Development, Office of Policy Development and Research and Urban Institute colleagues Rolf Pendall, Leah Hendey, Megan Gallagher, Reed Jordan, and Jasmine Simington for their careful review and feedback on earlier drafts of this brief. Changes were made to this brief in February 2016. When reporting percentages, data were previously not reported if the N value in the numerator was less than 30. The changes modify the way data are reported in figures 1, 2, and 4 and report all N values as percentages as long as the denominator is over 30.